[SatNews] As a performance milestone is completed their launch vehicle is now one step closer to transporting humans. United Launch Alliance (ULA) today announced the completion of a key milestone that could lead toward the certification of the Atlas V launch vehicle for human spaceflight. ULA has successfully completed the second required major performance milestone of its Commercial Crew Development (CCDev) Unfunded Space Act Agreement. 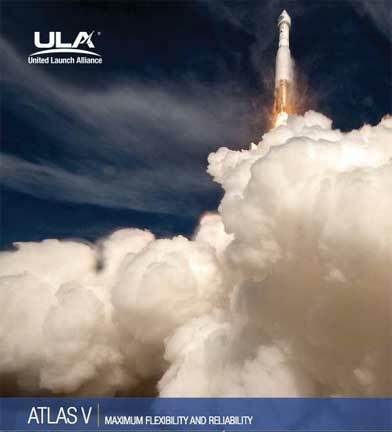 The Design Equivalency Review (DER) completes a rigorous assessment of the flight-proven Atlas V launch vehicle’s compliance with NASA human spaceflight requirements. Three of the four current NASA CCDev partners providing commercial crew integrated services have selected Atlas V as their launch vehicle. To successfully complete the DER, NASA human spaceflight experts and ULA engineers worked over a span of several months to perform a detailed review of all NASA requirements and processes, and identified the extent to which the Atlas V meets those requirements. Because Atlas V is already certified to fly the nation’s most complex exploration and national security missions, the need for any lengthy and inherently risky launch vehicle development program is expected to be avoided. The flight-proven Atlas V, which has already been certified to launch high-value NASA robotic missions, reduces the risk of launch vehicle development and early flight failures inherent in new, unproven designs, Sowers added. “With 27 consecutive successes—98 for the Atlas program as a whole—Atlas V provides the highest confidence, lowest risk solution for human spaceflight,” Sowers said. As NASA moves forward into the first phase of the Commercial Crew Integrated Design Contract (CCIDC), ULA will offer human-certified Atlas launch services to meet the needs for the crew transportation system providers. “The CCIDC is the critical first step towards creating a robust commercial crew transportation capability to low-Earth orbit (LEO). ULA looks forward to continued work with our customers and NASA to develop a U.S. crew space transportation capability providing safe, reliable and cost-effective access to LEO and the International Space Station.” Sowers said. For more information on ULA, visit the ULA Web site at.